Six of the last 11 years have seen more than eight million acres (3.2 million hectares) burned in the US. 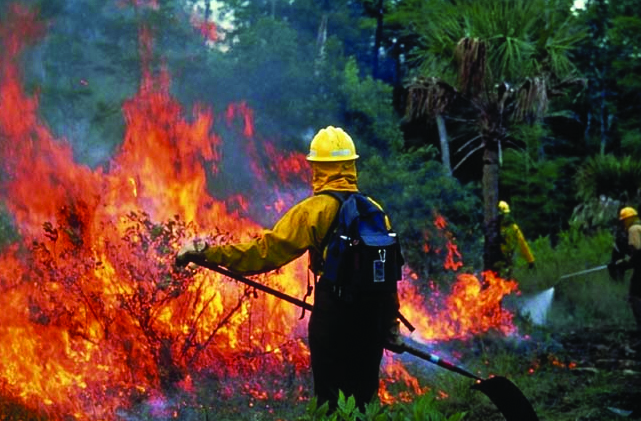 To combat these infernos, the modern firefighter looks to computer models, like those provided by the US National Center for Atmospheric Research (NCAR). There's much these models can tell, and much they can't. 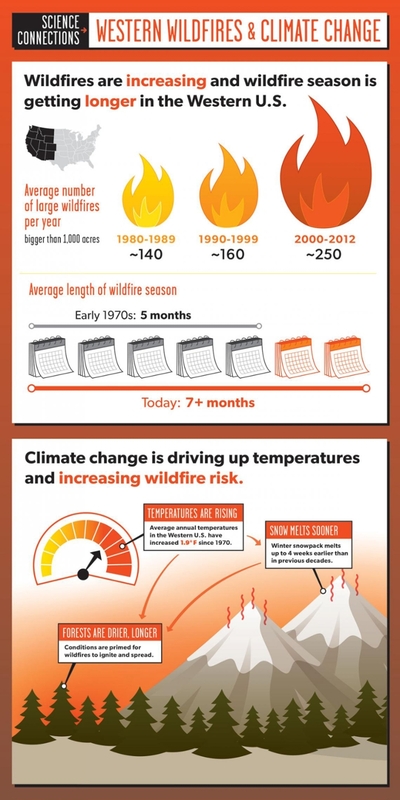 Global warming is increasing the number of wildfires. 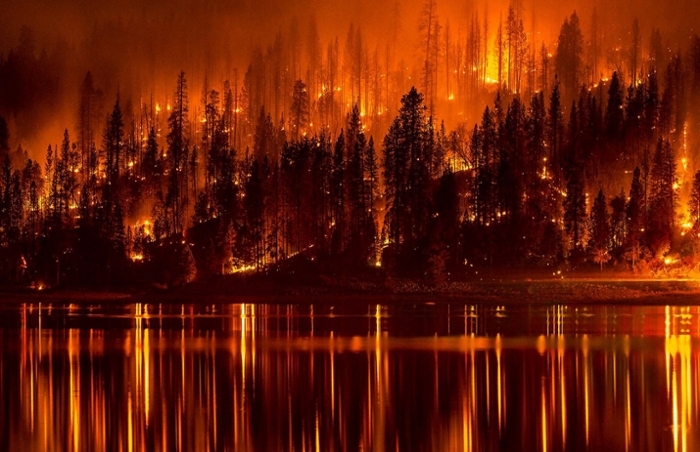 Firefighting in 2015 looks to computer models for help — before, during, and after a wildfire. Computer models are a great help, but not infallible. The western United States is on fire. Again. Frequent wildfires have become the new normal, up by 78% since 1970. In six of the last eleven years, fires have consumed more than 8 million acres (3.2 million hectares), with 2015 on pace to set a new record. 65 fires remain unchecked, and the toll is still rising. The spike in wildfires is attributed to global warming; temperatures in the western US are rising at double the pace of the global average. By 2070, the US National Center for Atmospheric Research (NCAR) predicts the number of days over 95º Fahrenheit (35º Celsius) will quadruple. Rising temperatures mean earlier snowmelt, leading to drier conditions and hotter temperatures that leave forests vulnerable to even a spark. Nine out of 10 times this spark comes from a human source (lightning and lava flows still account for a small percentage), which firefighters then have to battle for weeks at a time. Armed with hoses, trucks, and helicopters — and of course lots of water —modern firefighters now also have computer models at their disposal. By predicting where a fire will be and how fast it will get there, models help firefighters allocate resources strategically. A new type of model offers more precise predictions, such as when a fire will accelerate or produce fire whirls. It can calculate when downdrafts from a cloud might cause a change in fire direction or intensity, or how airflow coming down from a mountain might cause a fire to grow in oddly shaped patterns. NCAR scientist Janice Coen has developed two such models. Funded by the US National Science Foundation (NSF), NCAR aims to understand the dynamics between the atmosphere and fire. Weather prediction models consist of fluid dynamics equations based on, among other things, laws of mass conservation, thermodynamics, and motion. Coen’s models assume a fire is affected by natural weather conditions, while also recognizing that a fire creates its own weather. As fire blazes across acres it releases heat into the sky, pulling air from behind and creating winds that literally fan the flames. Fire modeling is actually a weather modeling problem. You can be pretty confident about the weather forecast you are given for tomorrow, while the forecast for several days from now may be less good. Wildfire models cannot predict which burning embers lofted ahead of the fire will light the would-be tinder on which they land. And, like any tool that tries to predict weather, fire-spread models are not infallible. While Coen's models of fire behavior help support fire fighting during a fire, Professor Christina Tague’s models look at how fire risk changes over time and space. 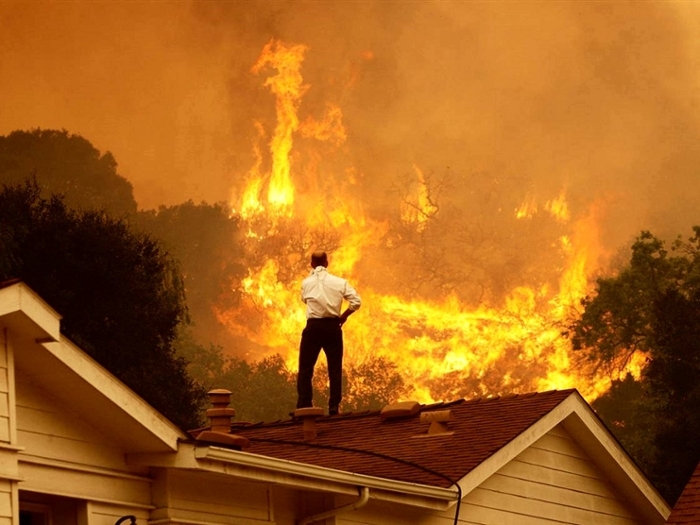 Tague, of the University of California, Santa Barbara (UCSB), is investigating whether land management can reduce these risks before the fire starts. Tague's work builds on the Regional hydroecological simulation system (RHESSys), an open-source software portal with over 75 algorithms that represent how water, climate, fire, vegetation and soil interact over space and time. Her NSF-funded approach links a social science model to improve understanding of the biophysics of fire and its effects. Tague and her collaborators will integrate models of forest growth, fire risk, and hydrology with models of how pre-fire forest management decisions are made. This combination will help them assess the potential of fuel treatments like thinning a forest, removing fallen trees, leaves, branches, and other understory vegetation that act as ladders that fires climb into the tree canopy. Tague’s wildfire model offers two advancements. First, it adds a sophisticated representation of the water cycle that can investigate the impacts of both fire and fuel treatments on water—how it is used by vegetation and how much ends up in streams. Wildfires can significantly change the water supply by altering vegetation and soil characteristics. They can also impact water quality by increasing soil erosion. Before fires, how much water is available for vegetation can be an important indicator of fire risk. Water and fire are closely linked and Tague’s NSF-funded model will capture these interactions. In addition, her model provides insights into how management decisions affect fire risk. “There are many factors that determine when and where fuel treatments are done. For example, when there has recently been a fire, the risks of fire are fresh in the public mind, and this can lead to pressure for responses from public institutions. We don’t really know if this is an efficient use of the often limited funding available for fuel treatments,” Tague says. As high-performance computing (HPC) advances, so too does the ability to predict the weather and how to fight fire and strategically manage landscapes where fires will continue to occur. HPC enables researchers to include larger amounts of atmospheric and land surface data, at increasingly finer resolutions, and to explore the implications of many different scenarios. HPC also bestows an ability to integrate disparate models and multiple algorithms to offer comprehensive and more predictive firefighting and fire risk management tools. We may always have to live with wildfires – but with the better modeling that comes from HPC, we may reduce the risks to things we care about.